Through out my life I watched my mom organize, plan and multitask like no one I’ve ever seen– with ease. I was always there by her side as her little helper (and later as her actual more capable helper) to assist in whatever she was putting together. My mom organized huge charity galas and philanthropic events, political fundraisers and business events. She organized amazing birthday parties for family and friends, Bar and Bat Mitzvahs for us and even friend’s kids and family holidays. She had dinner parties all the time and with all this always going on, she organized and cooked dinner for our family almost every single night too. I learned from watching the master! Sure, I learned how to put events together, how to party plan well, how to raise money for good causes, how to manage to cook dinner while putting together 5 other things with out getting stressed out. All wonderful lessons but the most important lesson of all- I learned how to celebrate life. Through all this organizing and multitasking, the underlying theme for every single thing was celebration of something positive. Brining joy into people’s lives through celebration and togetherness and making people happy. This was and IS my mom’s artistic gift. I’ve never met anyone who does it like she does. I feel I too got that gift although I am no where near a master like she is but, it’s kinda…”my thang.” I love getting people together. I love to celebrate life and make a point of letting the happy times shine bright in my life because there are most certainly, so many hard and sad times too. Organization = Peacefulness: When something this big, this life changing is about to happen- I want to be as prepared and organized about it as I can. I find this creates a peacefulness within me and thus a peacefulness around me. I believe our home is at peace when I create that peace (not just the candles lit and incense burning kind of peace- although I do that too). I believe my husband feels more relaxed when he gets home to a clean, organized home with a happy and mellow vibe no matter what his day was like. I believe I wake up feeling calm when I have put to rest all things I could the day before to create a new, fresh start to the new day. I also feel calm when I know what I need to do this day and feel I can achieve my goals. Organization is the first step to creating calm. Knowing what I need to do and then calmly, with out stress or sense of urgency, getting it done. It’s not hard to do and it feels quite good. Make a list: I make a list of all the things I need to do to prepare for baby’s arrival and give myself plenty of time to accomplish this list (factoring in the days I do not feel well because I have many of them). If there are items on the list that require my husband’s involvement I create a separate list for him and clearly outline when I’d love for those things to be done. This makes it easy for him to help me and then he can feel good about creating the peace too! Thank people in real time: When I get a gift for the baby or for us I add the detail of the gift to my list of thank-you’s and then immediately write that person a thank you note and send it (I’ve opted to go “green” with my thank-you’s and use www.punchbowl.com to send them out. They’re cute, I can get them done fast while doing 8 other things on my computer and people seem to love them. Create One Registry: I used www.myregistry.com because you can add many different registries to it and combine them (although mine is mostly amazon.com) but your friends and family only have to deal with one link. It’s very user friendly for them. I use this for myself too. I have talked to new moms, read books, blogs, done tons of research all to figure out what we need and want. I added items to my registry that I will go and buy for us in the end if they’re not gifted. This way I have a solid and ongoing list of all the stuff I’ve learned we’d want or need. It keeps me organized and is easy for others who are sweet enough to treat us to things. Nursery: A work in peaceful progress: As furniture, gifts and what not for the baby’s room and for the baby herself have arrived, I’ve been putting them in her nursery and closing the door. I haven’t really gone in that room until this past weekend, in order to begin my process. First I went through and opened all the things that require cleaning before touching her newborn baby skin. I put them in a laundry bag and set them aside. 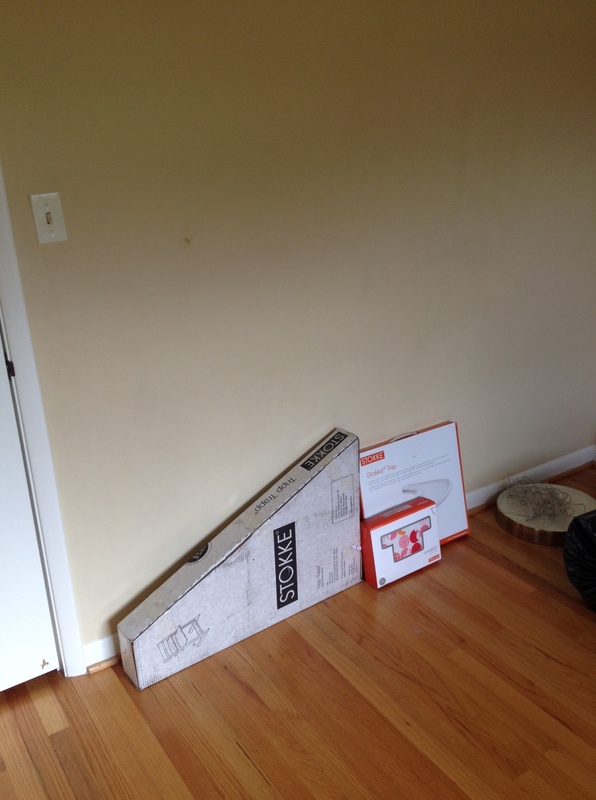 Then, I moved all the items in boxes that do not need to be dealt with right now against one wall. After that I vacuumed the room, cleaned and disinfected everything (including door knobs and windows, closet rods, etc. I used non-toxic and baby safe cleaning products to do so. After that, I put on a shelf in the closet some items that can be dealt with a little later (once I have a dresser and drawers to put things in, counter top space, etc) or things I don’t want sitting on the floor. This includes mom/dad’s diaper bags (which are so cute and we can’t wait to use)! 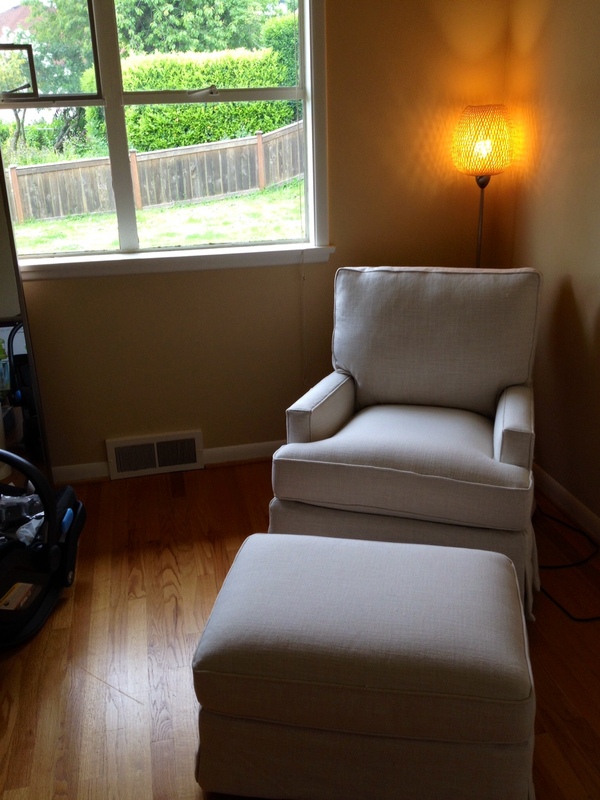 The nursery chair was delivered already so I cleaned and vacuumed it and then sat and rested for a moment. This was a LOT of work. I spent hours doing all this. When you’re pregnant doing things like this can take a lot out of you. This ONLY reinforces my reasoning to do it NOW and not wait until I’m 8 months and huge and stressing. No thank you! 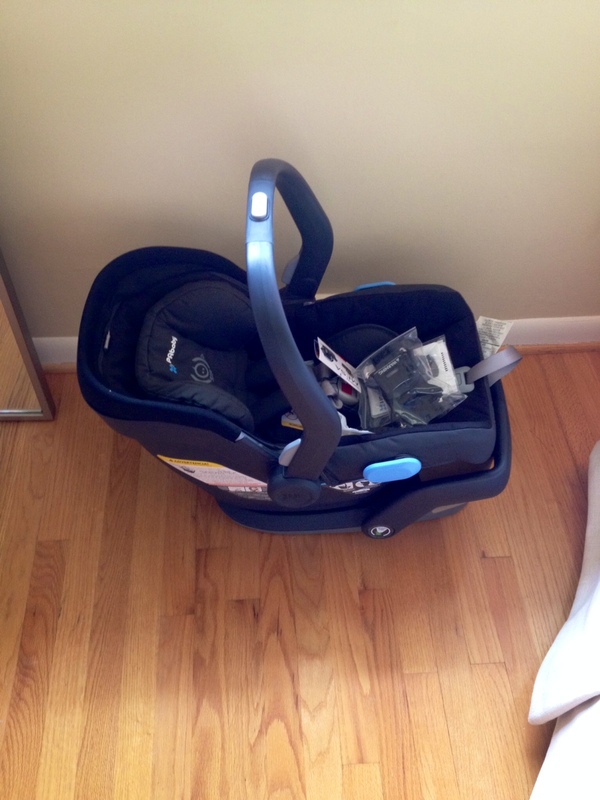 The high chair we picked out is the Stokke….I put the accessories with it all together and this is one of the “dad to assemble” items that can wait. 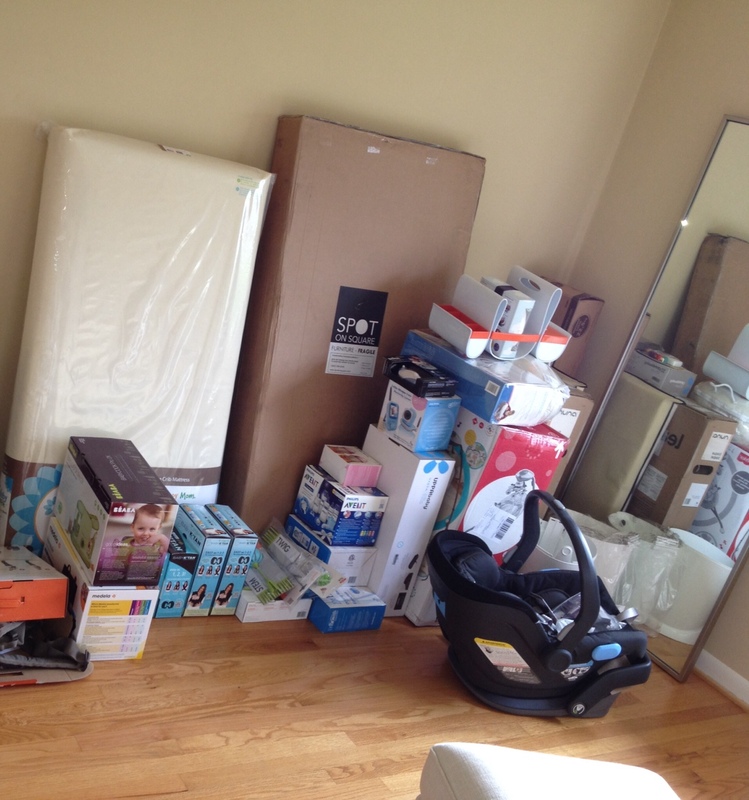 Other dad to assemble items include the crib and eventually there will be a changing table and dresser. These will all get done by the one month away mark for total peacefulness but are not on the “do right now” list as they don’t involve ME. The things that involve me need to get done sooner than later and while I’m having some feel good get sh-t done days! 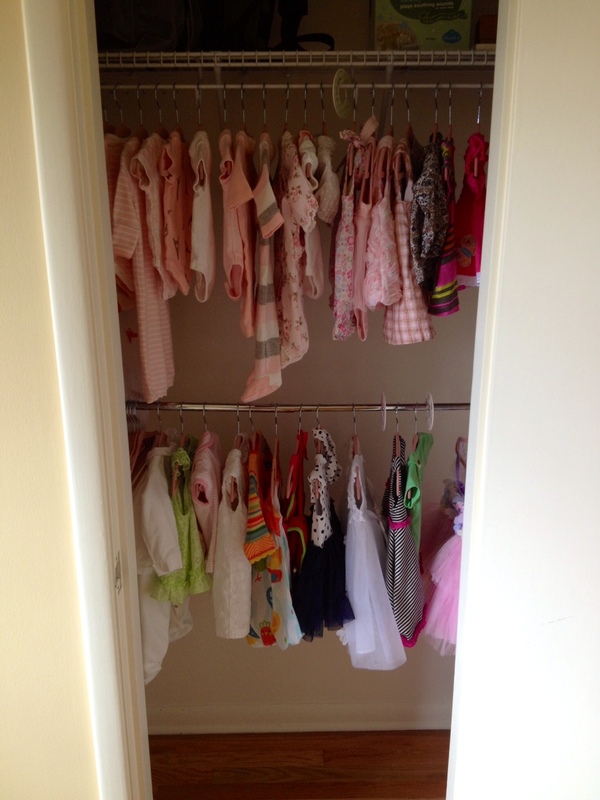 Next I took my closet organizers that say 0-3 months, 3-6 months, 6-9 months, etc. 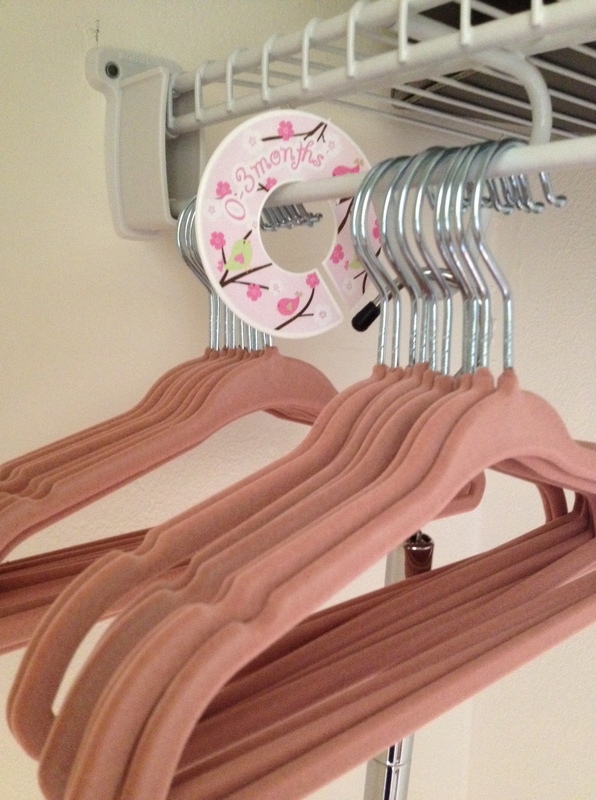 and soft velvet pink baby girl hangers and got the closet set up for clothes. I did 2 loads of laundry using Honest detergent and no dryer sheets (you never know if you’re baby will react to those fibers so it’s best to go with out them). 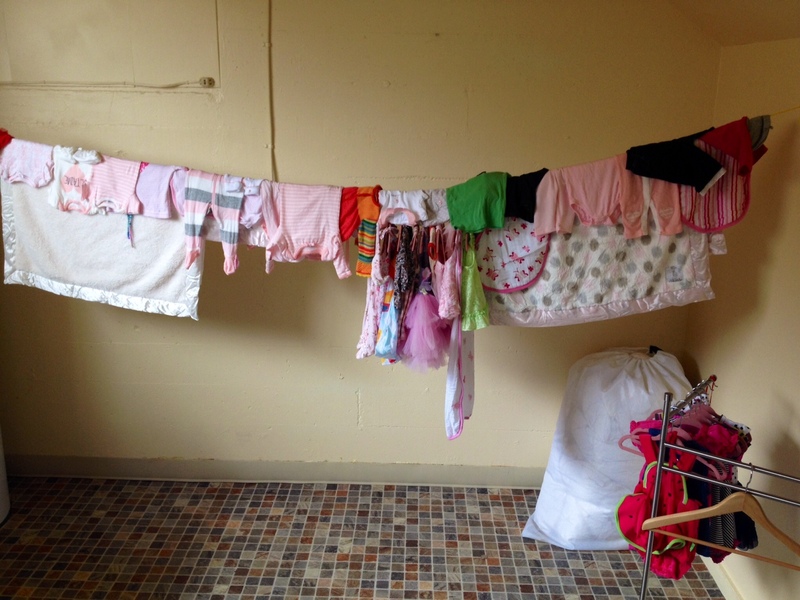 I hung what needed to air dry and otherwise did a low heat, delicate dryer setting for the rest. Then I folded everything that doesn’t have a home yet (because they require drawers) and put them in a large garbage bag. This way, they are clean, folded and ready to be put away when the dresser arrives and is assembled. Easy breezy. The rest, I began to hang up in order of sizing and as we get more things, I will just follow the same program as it comes. 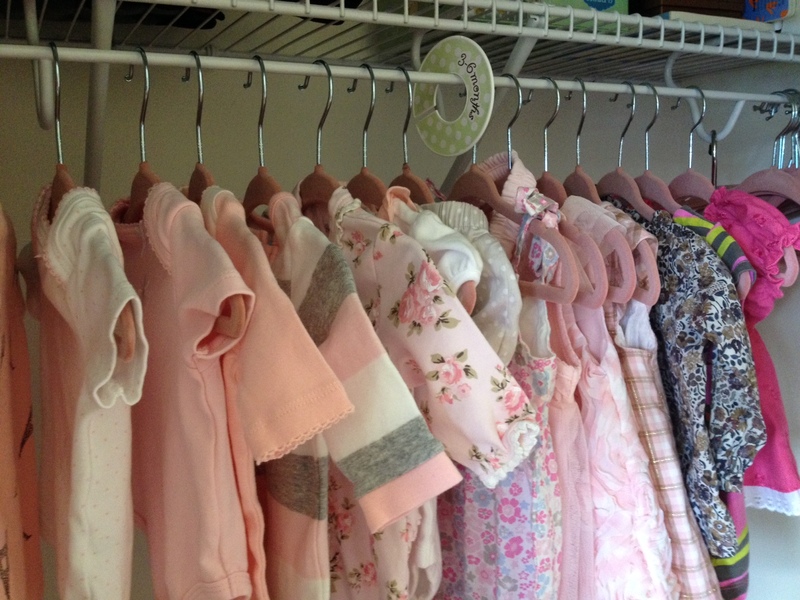 I cried only 4 times while folding baby blankets, baby socks, onesies, hanging up little dresses. Thank you pregnancy hormones for always keepin’ it real!!! 🙂 Finishing this nursery set up step felt SO good. I got much accomplished and am excited for next steps! 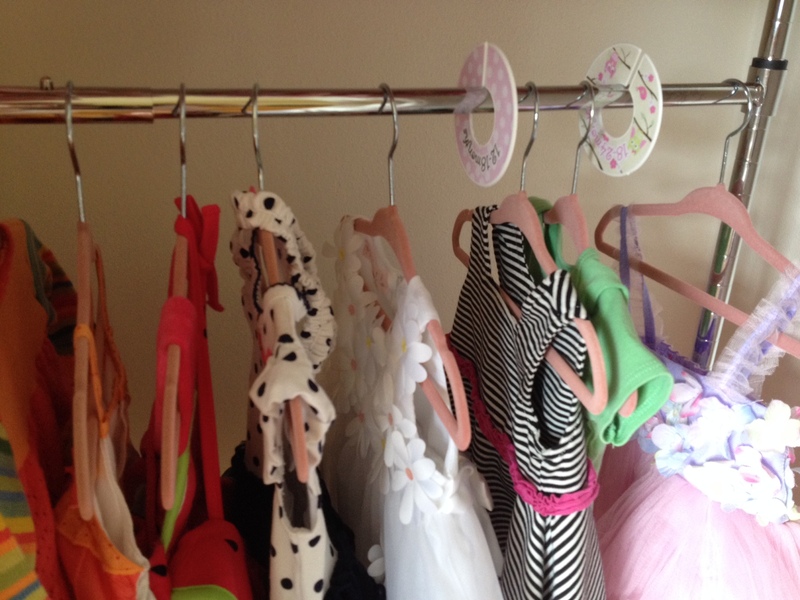 Note on our nursery: This room will be a shoe-free-dog-free-sickness-free-stress and drama-free zone. That means, our sweet dog and her hair- not allowed. Take your shoes off before entering. Please don’t come in here if you are fighting or have a cold (in fact don’t come over period no offense). If you are bringing any drama to our life or stress leave it at the door baby. This is the peace-zone and I want our baby to feel it and become it. I think it’s important to set up these concepts before the baby comes and agree with them as a couple because it’s realistic to imagine times where we’ll have to check each other on this or even….stand tall as a couple and just say “no” together, for the sake of our baby. Organizing for peace isn’t just about making lists or cleaning honey…so much more!!! The Hospital Bag (mine and hers): I haven’t packed these yet. It’s still too early for me. But…it’s on my list and it will be packed before that month away date you betcha! I found this awesome list to help me pack mine and so I thought I’d share it with you! 2. Shampoo, conditioner and soap, skin care products, etc. 5. 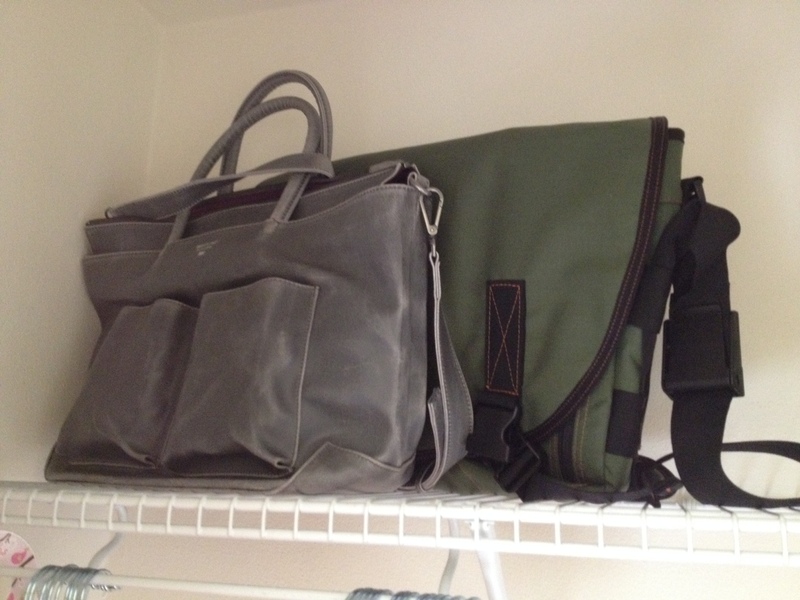 The diaper bag: Pre-stocked with wipes and diapers of your choice, cream for diaper rash, etc. 7. Breast Pump/nursing pads: The hospital will have both of these, as well, but it is something I would prefer to use my own of. 11. Socks: Also need to keep their little piggies warm! 12: Mittens: To keep them from scratching their poor little faces. 13. Pajamas/clothing: The hospital gives you a white onsies and that is it. So if you want your baby to wear anything else you better bring it! 14. Going home outfit! You know this is going to be photographed right? Right! I can’t wait to pick this out! 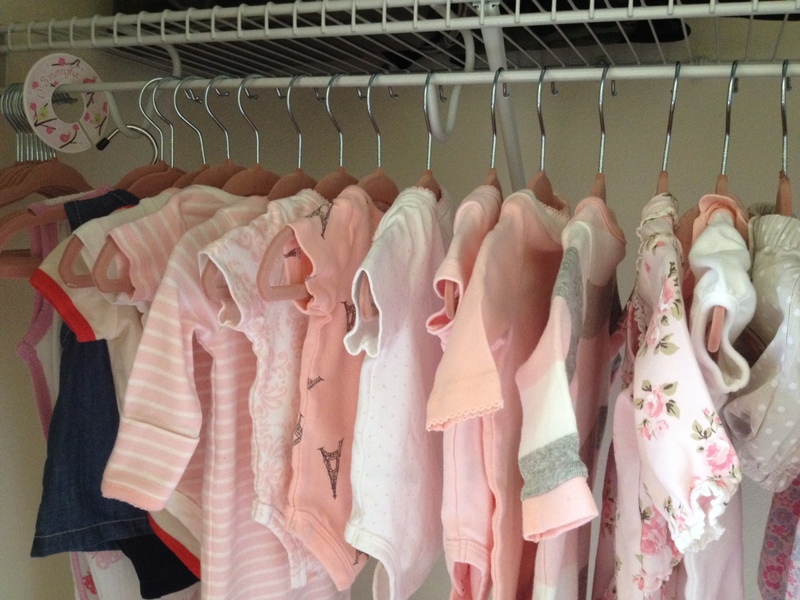 Be Ready Then Rest: There is nothing I find wrong with being totally ready, set, put away, cleaned and organized for our daughter’s arrival 4 weeks before she’s supposed to come. If I have learned anything from my pregnancy it’s that the fantasy isn’t always the reality. Just because I WANT to have 12 weeks of being able to put stuff together and get sorted out- doesn’t mean I WILL have that. I don’t feel great, I haven’t and who knows- it could get worse! So to be ready and have an extra 4 weeks to just rest and “be” before she comes…is 100% perfect and CALM to me. An interesting side note on this entire concept is that being Jewish, there is a very “old school” and superstitious way of looking at this process which I am acutely aware of. This is, not to do anything until the baby is actually born and okay. There are variations on this but the most extreme one is to not bring anything into the home until the baby arrives because God forbid, the baby dies during birth (I know, gasp- hard to even type those words but THIS is where all this came from and I get it- the death of baby and mom was more common way back when and there were reasons for some of these beliefs and practices (but not in today’s world). So to me- the person who celebrates life every chance I get, who desires a totally peaceful, zen-like, calm space for her baby to come home to, who wants the people IN our home to be peaceful too, who believes organization leads to peacefulness….to me- this actually feels toxic, negative and kind of wrong. That’s just ME though- it may feel totally right for YOU! And you know, someday I hope my daughter will get to have a baby and she’ll decide what she wants to do and how she wants it to be done and I will support her choices and do whatever I can do to make her life happier, easier and more peaceful. Isn’t that my job? I’m her mommy. My job starts now and I’m doing all I can in the way I feel is right, to do a good job for her. With love and peacefulness I’m signing off to go organize a dinner while I clean the house because we’ve got new friends coming over and I think it’s time to celebrate some life!!! OK, Mom may have seen these pics before and therefore had an opportunity to do her first cry yesterday, but she actually had a second cry just before going to sleep last night saying, “Sarah is going to be a mommy!” What can I say, she has two cries up on me……..I broke a happy tear also, just now when I saw these pictures!! !